The holidays are upon us and taking care of oneself doesn’t have to be compromised because of the season. There are plenty of healthy food options available, cooler temperatures allow for more movement outdoors, and the studio is open 365 days per year with special holiday class times. Another tip to stay healthy during the holidays is to eat a light nutritious meal before heading out to holiday gatherings. This will help you to resist the temptation of over-indulgent food choices. If you drink, do so in moderation. Drink water in between cocktails, beer, or wine, and stick to mixers like soda water or fresh fruit juice. Take advantage of the cooler temperatures and walk, run, bike, garden, or practice any other outdoor activity you enjoy. There are benefits to working out outdoors as opposed to an indoor gym which include: fresh air, sunshine and a dose of essential Vitamin D, and the terrain works muscles gym equipment cannot provide. You can also keep a regular practice, the studio is opened 365 days a year with special class times offered on holidays. On Saturdays at 12 noon during the month of December, the studio is offering Inferno Hot Pilates classes. Check the website or Facebook page for updated hours and classes. Happy Holidays from your Sarasota Bikram Yogis! Welcome Kristen Perez, certified Inferno Hot Pilates instructor, to the Bikram Yoga Sarasota studio. Kristen joins us from New York City and is teaching Inferno Hot Pilates classes every Saturday in December at 12 p.m. Last year, she completed her wellness coach training with Gabriela Walters. Despite having a day job as an accountant, Kristen made staying active a priority trying just about everything including running, swimming, cycling, yoga, dance, basketball, and various other sports. As a longtime practitioner of yoga, she was always drawn to the importance of the mind-body connection in practice. Outside of yoga, she had not found this connection. She had tried other activities to find it, but always fell short. Two years ago her mom asked her to try this new class called Inferno Hot Pilates. Skeptical at first until her mom mentioned burpees, planks, and serious ab workouts! Once she tried it, she discovered it was much more than that and was hooked! For Kristen, the Inferno Hot Pilates class really calls for your “inner warrior” and is a great compliment to a yoga practice. So, if you’re looking to strengthen your practice, or just want to get a great workout and feel awesome doing it, then her Kristen’s is what you’re looking for! Inferno Hot Pilates is a training system which combines Pilates principles with High Intensity Interval Training (HIIT) and it is performed in a room heated to 95 degrees Fahrenheit and 40 percent humidity. It is a high-intensity, low-impact exercise, easy on your joints and muscles. It is an intense, full-body workout designed to strengthen muscles, increase flexibility, and improve overall health. Fast results: the quickest way to burn fat and gain/maintain muscle at the same time. Super-efficient: 20 minutes of HIIT burns as much calories as 45 minutes of running. Creates long lean muscle mass and a stronger core. Prevents the body from hitting a plateau. Boosts metabolism and will continue to burn hundreds of calories hours after the workout is complete. Standing Head-To-Knee pose, or Dandayamana Janushirasana, is a balancing posture with a multitude of benefits for both the mind and body. The Sanskrit name broken down into six parts means, danda, stick; yamana, balancing or maintaining; jana, knee; shiksa, head; and asana, posture or pose. This posture is exercised in the beginning part of the class as part of the balancing series. Practicing balance enhances mental concentration and focus, determination, and calmness of the breath and mind. What is most important is the correct form not going further into the posture before the initial part is mastered. You are in the posture and reaping the benefits if you have the standing leg’s knee locked and holding your foot/leg. Pull in the abdominals while doing so to protect the lower back. Slowly, lift the leg and kick the heel out while trying to straighten the leg. Pull the toes back towards the face to stretch the Achilles tendon. In this expression of the posture, the muscles of the upper back, deltoids, and biceps are also being strengthened. The last part is to bend the elbows and touch the forehead to the knee stretching the spine and improving blood flow to the brain. With all postures keep the breath flowing through the nose and practice at your own pace honoring the body without overworking. With the red tide affecting our beautiful Gulf beaches, it gives us a good reason to explore our extraordinary area and look for other outdoor activities. Approximately 40 minutes from the downtown studio is the Warm Mineral Springs Park in North Port. This is the only warm mineral spring in Florida and visitors have been frequenting these so called healing waters for decades.There is a plaque upon entry titled, The Original Fountain of Youth, which states the Springs is the Fountain of Youth sought by Ponce De Leon. An underground spring produces nine million gallons of water daily. The water is 87 degrees year round, which feels comfortably warm yet still refreshing in the hot summer months. Soaking in the Springs is a form of balneotherapy, which is treating disease through immersing oneself in mineral waters. Health claims include increased circulation and blood flow, increased metabolism, absorption of essential minerals through the skin, and help with other digestive issues and diseases. These springs are rich in over 50 minerals including sodium, potassium, silica, sulfate, selenium, and radium. Minerals are alkaline which can help the body recover and regenerate itself. They also contain positive ions which can help with chronic pain and some types of disease. Not all of the health claims are not proven to be true, although soaking in warm mineral springs induces relaxation which in turn calms the breath and quiets the mind much like the Bikram Yoga practice. The park is surrounded by breathtaking grounds with grassy areas and shady trees to relax under. It is open year round (except on Christmas day) and the cost for Sarasota residents is $15. If interested, more information can be found on their website. Even though the situation with the beaches can be disheartening, it is fun to explore and discover the abundant natural beauty around the area. Places in nature like the Springs can compliment a yoga practice by providing relaxation and a sense of overall well being. Eagle Pose or Garudasana was named after Garuda. In Hindu mythology, Garuda is a bird creature, half eagle and half human. He is known as “King of the Birds.” He represents birth and heaven and is associated with sun and fire. During this posture, along with strength, flexibility, and balance you also sharpen the third eye chakra from the concentration of focusing on one point in the mirror to help hold the pose. The name Eagle relates to the keen and observant eye of an eagle who can see 4-8 times stronger than the average human. This pose helps to enhance intuition and clarity. In this posture, first you swing your right arm under left, crossing at the elbows and wrists. Palms face each other and fingers are below the nose. Pull the elbows down, this helps to open up the shoulders. Then, sit down low and twist your legs by lifting the right leg high across the left wrapping the foot behind the lower calf so all five toes are visible in the front mirror.. In the second set, you switch sides, the left arm swings under the right, and the left leg wraps over the right. Sign in when you arrive to the studio. Leave your expectations and your shoes in the lobby. Come early! If you are on time, you are late! Classes start on time, the studio is locked during class. Turn off cell phones and please refrain from using them in the studio. In consideration for those with sensitivities or allergies, please refrain from wearing scented products in class. No perfume, cologne, essential oils, or any fragrances in the yoga room. Bring only mat, towel, and water into the yoga room. Please leave purses, gym bags, cell phones, watches, fit bits, gum, and other personal belongings in the dressing room or your car. Please find a space close to the mirror, filling up the classroom from front to back (beginners may stay in the back). Please work together to create enough space for everyone and a good flow of energy through the room. Maintain silence in the yoga room before and after class as many students utilize this time to quietly meditate. Respect the silence of your neighbors. Follow the directions exactly, as they are given, to the best of your ability in each posture. Focus on what you can do now, rather then what you can’t do yet. When you are not actively doing a pose, try to remain calm and still, and focus on yourself in the front mirror. Any extra movement are distractions to you and others. Stay in the yoga room. It’s always okay to take a break if you need to. If you must step out, please notify the instructor first, and re-enter the class between postures. Allow yourself to sweat with no wiping. Sweat has a cleansing effect and helps regulate your body temperature. Practice on your mat and towel unless you are instructed to step off your mat. The towel is there to catch the sweat. Please do your best to keep sweat on your mat/towel. (Hand towels are provided to wipe the sweat off the floor after the standing series. We do NOT use them or any prep for the postures). Move together with the class during postures. Please reserve additional postures or stretches you want to practice until after final Savasana. Be a good role model. Practice your stillness and discipline between poses. Notice if you are in front of a beginner, they will follow you. Enjoy Savasana. This is the final relaxation. Please do not leave the room until the teacher does. The last few moments of relaxation in Savasana at the end of class may be the most important. Place rental mats on the ballet bar or hangers in the back of the room when finished with Savasana and rental towels/hand towels in the bins in the lobby or the changing rooms. After class, respect others’ Savasana time and leave the room quietly – walk softly, roll your mat carefully, and shut the door gently. Please limit your shower time to two to three minutes in consideration of others. Check to make sure you have your personal belongings, if you forgot something be sure to come back within 24 hours to collect. Take the peaceful energy you create in class into the rest of your day. You may have noticed your Bikram Yoga practice is a little extra sweaty during the summer months. While the outside temperature has increased, it may seem like that translates into higher temps in the studio, but it’s the higher humidity, not the heat that you are feeling. A regularly practice is essential during the summer to help you better acclimate to the outside temperatures and to keep your practice consistent throughout the year to reap maximum health benefits. Here are some tips on how to best tolerate the increased humidity both inside and outside of the studio. Sweat is your body’s natural air conditioning. With the increased humidity in the air though, sweat doesn’t evaporate from the skin as readily and internal body temperatures may rise. This may also cause an increased heart rate. As with any session, it’s important to listen to your body. Remember, every day and every body is different. Honor what yours is feeling and don’t push it beyond reasonable limits. Staying hydrated assists your natural internal ac unit by allowing you to sweat to cool down. Keeping hydration levels consistent the days before and after practice is key. Remember, you can also hydrate with the foods you eat and with other non-alcoholic and caffeine-free beverages along with plain water. Also remember to replace lost electrolytes. You can avoid sugary sports drinks with natural electrolyte-rich sources such as coconut water, watermelon, bananas, and vegetables. You don’t have to go out and overspend on expensive yoga clothing. But it is important to wear moisture-wicking materials. Avoid cotton clothing because they absorb sweat, become heavy, and get in the way while in some postures. You want to wear clothing that moves with you and does not require adjusting in order to stay in a meditative state during practice. It’s important to stay well hydrated in the hot summer months upon us. It’s not just the heat that can be depleting, but also the increased humidity. Even with increased heat and humidity, it’s important to keep up your Bikram Yoga practice during the summer. It will actually help you adjust better to the temperatures outside and keep your mind and body in shape year round. Fresh water, mineral water, herbal caffeine-free teas, and juice are all excellent ways to replenish fluids, but the foods you can eat play a big role in hydration and cooling the body down as well. Here are some examples that will help you to have your best Bikram yoga practice this summer. An added bonus with this juicy fruit is that along with being rich in carotene and vitamins A and C, it’s rich in electrolytes. It’s important to replenish electrolytes after sweat-inducing exercise. Watermelon is one of the most water-dense fruits you can eat. Eat it whole or extract the juice for a yummy alternative to plain water. It is 95 percent water and is perfect for snacking on, juicing, and even added to plain water to give it flavor. This cooling vegetable can also reduce swelling, like on puffy eyes, and help calm sunburn. In an earlier post, we mentioned the powerful benefits of peppermint, one of which is it’s cooling effect on the body. You can use mint in a variety of ways to reap its benefits. Chop it up and use in salads and on other vegetables, steep the leaves to make a refreshing tea, add it to plain water, or add to fruit salads and desserts. When practicing Bikram Yoga, you are in your most natural, real, vulnerable state. Even if your hair was fixed, or for the ladies your makeup applied perfectly, the sweat from the heat and humidity is sure to mess it up and melt it away quickly. This is one of the purest forms of yoga. There are mirrors surrounding you and for a good portion of the class, you are instructed to look directly at yourself in them. Clothing is simple because the heat and humidity of the room dictate that it pretty much has to be. Other than your mat, towel, and water, there is no need to bring anything else into the yoga studio. This includes watches and watches that are synced to a mobile device, smart phones, fitness tracking devices, etc. Bikram yoga is beneficial equally for the mind as it is the body integrating the two together. This is why it’s called a 90-minute moving meditation–movement in the body, calmness of the mind. Give yourself these 90 minutes to dedicate this practice solely to you without outside distractions of text messages, emails, phone calls, etc. If you are on a specially-regimented fitness routine where tracking your heart rate and other fitness-related goals is necessary, use the device in just a few classes, get an average of your rates, then leave it at home. Using such devices breaks the union between the mind and the body. It takes away from listening to your own body. Each class may feel different on any given day and it’s important to stay in-tuned with the messages you are receiving. These gadgets take yoga out of its natural state. This is the state of yoga which has proven to be beneficial for thousands of years. Reap the maximum benefits of this incredible practice in your most natural, real, and gadget-free state. The last post was about the importance of following the exact Bikram Yoga instruction not only to receive maximum benefits, but to also protect the body when moving through the postures. Here are some additional instructions taught during the practice and the reasons they are important. In the first breathing exercise, called pranayama, the fingers are clasped under the chin and the stomach is sucked in for six counts of inhalation and then six counts of exhalation. When the head goes back, you’ll hear to breath out through your mouth with a “ha” sound. This is to warm up and prepare the body for class. With the exception of the two breathing exercises, you will will hear to breath through the nose only and this is to help cool the body down. During standing bow, the ankle is grasped from the inside to assist with opening the chest and shoulder once deeper into the posture. When kicking the leg back and up while the upper body and opposite arm are down and forward, it important to keep the arm that’s holding onto the foot relaxed to allow the chest and shoulders to open up. Too tight of a grip and a tense arm will prevent this opening. The same holds true in floor bow when holding onto both ankles and kicking the legs back and up simultaneously. You’ll be instructed to use the hands like hooks with straight wrists, this looser grip keeps the arms relaxed to again allow for the chest and shoulders to open up. When in standing head-to-knee and head-to-knee and stretching poses, kicking your heal out and flexing your foot back to your face is done to stretch the Achilles Tendon. This is especially important for the health and flexibility of the lower leg and for improving leg circulation. Keeping arms and legs close to the body in savasana allows for the heart to not have to work as hard to get the freshly oxygenated blood flowing faster to the arms, legs, and knees. When doing kapalbhati, or blowing in firm, breathing at the end of class, you will breath in through your mouth. This is to release toxins from the mind and body, cleanse the lungs and respiratory system, improve digestion, and help cool the body down. The Bikram Yoga practice is referred to as a 90-minute moving meditation, and is a powerful meditative practice, if you allow for it. One instructor says, “Bikram’s teachings, my words, your body.” What this means is to not let your mind wonder in its own direction altering poses or the timing of the series. Instead, focus on the words being said and follow along with your body's movements. The series has been carefully put together so that each posture prepares the body for the next. These series of movements were designed for maximum healing benefits. It is not a free-style type of practice where everyone moves to a different pace. When you get into the meditative state your mind benefits as much from the practice as your body does. The practice was designed to thoroughly follow the teacher’s exact instruction and not go into or out of the posture before or after instructed to do so. When the class stays together, a beautiful energy, a flow, takes place among the practitioners. It’s an energy from which they can feed off of one another creating a stronger, more focused practice. There’s another importance to those words, they are emphasized to protect different parts of the body and help prevent injury. One of the first ones you may hear is, “are you breathing?” Keep this in mind and check in with yourself throughout the entire practice. It doesn’t matter how deeply one thinks they can go into a posture if they are not breathing naturally, calmly, and through the nose. When you master this one skill, it allows for a deeper expression of the posture than when holding the breath or breathing too hard. The instruction of sucking the stomach in and holding it in during forward folds protects the lower back. During the floor series in wind-removing pose, the calf of the leg extended should be touching the floor; this keeps the hips in alignment. Another phrase that is heard in class is, “chest up,” this also protects the lower back and ensures the posture is strengthening the correct part of the back whether it is lower, middle, or upper. Lastly, “lock your knee.” Locking the knee in postures like standing head to knee is important so that you don’t hyper extend the knee joint. It also allows for the hamstrings to safely stretch. So while it isn’t always fun to listen to instructions in the Bikram Yoga studio, it’s important to do so to get the most out of your practice. Private lessons for individuals, groups, and athletes offer a world of benefits for those new to the practice, experienced yogis looking to take their practice to the next level, as a way to work through and past an injury, as a group activity, and for athletes to enhance their training. If you’re new to yoga and prefer to learn the practice in an individual setting rather than in a class right away, you can take advantage of this offering. Learn the postures the right way from the start. In this setting, you can stop to ask questions and have a custom session unique to your individual needs. Experienced yogis can benefit from private lessons when they have hit a plateau and want to advance in their practice. A small tweak can make a huge difference in the way a posture feels and benefits you. You can come alone or have a private lesson with a friend or significant other. For those with injuries, private lessons can help get you back on your path to being recovered and help the healing process go more smoothly. There’s no reason to skip out on practicing, you can learn modified poses to work around and through your injury. Do something different as a girls get together or with a bridal party, as a team building exercise with your peers, or with a group you may belong to who is wishing to change up their routine. Bikram yoga group lessons are a fun and unique way to spend time with the people you choose and have a class tailored just for you. Bikram Yoga is beneficial to an an array of athletes. Not only does it strengthen the spine, muscles, and increase balance and flexibility, these 26 postures are formulated to regenerate tissue, cure chronic ailments, and heal and prevent injuries. It’s no wonder the Bikram Yoga practice has become increasingly popular with professional athletes including San Francisco 49ers Tony Parrish; NBA great Kareem Abdul Jabaar; Kobe Bryant; Wimbleton winner Andy Murray; and many more–for its injury-healing and preventative properties and also to prepare the body to perform better at sports. Call the studio at 941-447-0090 for more information and pricing. There is a heightened awareness of where our food is coming from and how it is grown. Many are familiar with and seek out organically-grown produce. And then there is hydroponic farming which has been around for centuries. It is not organic, but it is 100 percent pesticide-free. So what’s the difference between being organic and hydroponic and why isn’t hydroponic produce organic? The major difference between organic and hydroponic farming is organic plants are grown in the ground in soil, while hydroponic plants are grown above ground under greenhouses. To be organic, you must grow in soil. The soil used to grow organic food is enriched with fertilizers and may contain animal manure and other animal-derived products. With hydronic farming, there is no dirt used. The seedlings are planted in elevated trays and water-soluble minerals are fed through an irrigation process directly to the roots of the plants. Since there is no soil used, this type of farming is very clean, pesticide-free, and produces nutrient-dense food that uses only one-tenth the amount of water than traditional farming. Locally, we have a hydroponic farm called The Homestead Hydroponic Farm. They use a system called Integrated Pest Management (IPM) instead of pesticides or any other sprays used as a repellant. This is an eco-friendly pest control method which incorporates insects, such as lady bugs, and flowers. Both act as natural protection for the produce. Because the growing takes place above the ground in greenhouses, twice the amount of food can be produced in the same amount of space with longer growing seasons. It is a very safe and nutritious way of growing food. Hydroponic produce is available from Homestead at both the Wednesday Phillipini Farmhouse Market and on Saturday at the Sarasota Farmers Market, nearby the downtown Bikram Yoga studio. They sell beautiful lettuces, tomatoes, and edible flowers. The farm is located next to the Myakka River State Park just 20 miles or so outside of town. You can be certain you are are eating clean, pesticide-free, and local food. You take care of you finances, household duties, work responsibilities, and possibly look after a family. But who’s looking after you? While we may be fortunate to have people love and care for us, there is no substitute for taking care of one’s own wellbeing. Self care is an essential part of having a healthy mind, body, and spirit and to be able to nurture others. While it would be great if self care came automatically, unfortunately it doesn’t. It is something we must mindfully incorporate into our everyday routine. Self care can mean a number of different things to different people. And it’s not to be confused with being selfish or self absorbed, it’s actually just the opposite. A healthy practice of self care makes you calmer, more focused, and less stressed; therefore more pleasant to be around and present when in the company of others. In a way, not making time for it In our lives could be interpreted into selfishness. Doing one healthy behavior on occasion is not enough, just like all things in life that matter and make an impact, it requires practice and doing so frequently. Practices can include committing to a diet of all organic healthy foods; taking a walk during a lunch hour several times a week to get fresh air, movement, and sunlight; meditating even for just five minutes per day; making time for a regular yoga class; scheduling a regular massage; etc. Any of these are examples and it may mean incorporating a few or maybe even all of these activities to form healthy behaviors. Adversely, if we don’t take this essential time to better ourselves we could impose stress on our minds and body which will lead to disease, cause you to give up, experience anxiety, and come to a breaking point because of work and mental overload. Neglecting oneself can also cause you to be not fully present damaging relationships with family, friends, and coworkers. A saying by one of the yoga instructions at the studio is, “take care of your body, so your body can take care of you.” That may just say it best! Holiday gifting season is upon us and shopping for someone can be a difficult task, but it doesn’t have to be. This year, give someone you love or care about the best possible gift there is, a gift to improve their mind, body, and spirit. 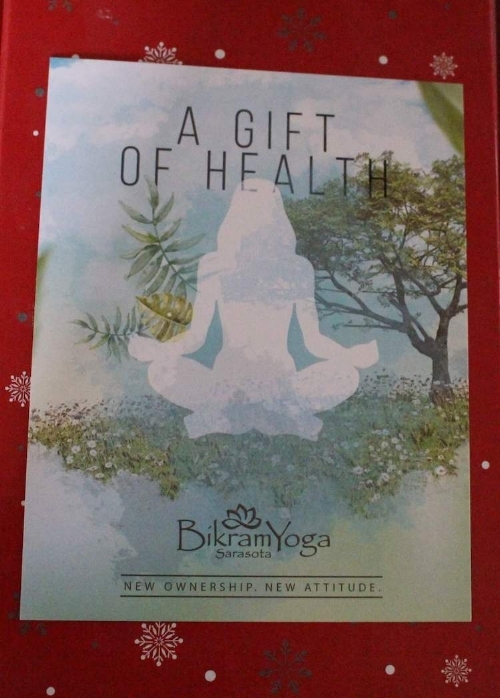 Bikram Yoga Sarasota offers gift certificates in any amount. If your gift recipient is a Florida resident and has not been to the studio before there is special introductory price of $50 for 15 days of unlimited yoga. Or choose one of the packages in ranges from three classes to an unlimited full year. This also includes access to Inferno Hot Pilates classes. And don’t forget about mat and towel service. This added bonus gives the gift of convenience by providing your own high-quality yoga mat to practice on and two fresh towels. Your yoga mat is cleaned and stored for you and there’s no soggy towels to carry home and wash.
Bikram Yoga Sarasota is the only authentic studio in Sarasota offering a full 90-minute class of two sets of poses and two breathing exercises. There are a lot of “hot yoga” classes offering “Bikram-style” classes in an abbreviated 60-75-minute time frame. It is these last extra minutes of class that are most beneficial. For some they may be the most difficult, but when you learn to calm the mind, you change your life. And there’s more, there is now a full line of retail in addition to the already wonderful Kulae mats, which are made from an eco-friendly material called thermo-plastic elastomer, so you can feel good about gifting them. Choose from a selection of logoed hats and shirts, high-quality and affordable Manduka yoga shorts for him and her, and Spalding tops for her. Holiday shopping made easy and you are giving the best of all. Attend a Bikram Yoga Sarasota posture clinic to fine-tune your practice and expand your knowledge and understanding of Bikram yoga. These posture clinics are two and a half hours long allowing for time to answer individual questions. They are held in a regular class-like setting with other students, but you’ll get tips, one-on-one attention, corrections, and guidance. Learn proper alignment and have time to practice that alignment in each floor series pose. This is the one time where you can talk during class and get the answers to your questions. This is an excellent way to improve your practice because you’ll learn and feel the proper way to do the postures and you can apply those principles in your own practice to get deeper into the poses. All levels are welcomed. Learn everything from the fundamentals to the final expression of each posture. Work through any obstacles and challenges you may be experiencing. Because it is in a class-like setting you’ll be able to listen and learn from fellow students who may ask questions you didn’t think to ask. Bring your mat, towel, and water to the clinic and wear your regular yoga attire.You can choose to attend class before the clinic if you wish to get your regular practice in, just be sure to hydrate, shower, change into a fresh set of yoga clothes, and have something very light to eat. Or you can choose to attend the 3:00 pm class afterward to practice what you just learned. We’re looking forward to seeing your transformations on the mat! You may have seen those thick cylinder-foam objects everyone seems to be rolling their sore or tight muscles over. While they are not a new invention–trainers and sports players have been using them for years–they are gaining popularity and they can be beneficial to your yoga practice if used correctly. Bikram Yoga has many benefits which include increased strength and flexibility and it is sometimes practiced in conjunction with other exercises like walking or running and also by athletes. These other activities can cause sore and tight muscles making your practice more difficult. Foam rolling can help get the body back into balance. Recently, The New York Times published an article on inexpensive ways to help you recover from a tough workout and foam rolling was included. They recommend one by AmazonBasics that seems to get the job done well. When foam rolling, you’ll want to start slowly and be mindful of your form. It is comparable to a deep tissue massage putting all of your body weight into those sore muscles. When you feel a tight spot stop on it for just a short time while breathing through the pain until the muscle releases, but don’t overdue it. There are several videos and techniques available to do these exercises correctly to avoid injury. Just like when having a massage, drink plenty of water after to flush out toxins that have been released. Two of the most important things to remember to not injure the lower back are not to roll the actual lower back itself and just like in the Bikram practice, you’ll want to tighten your stomach muscles. To get lower back relief work the muscles surrounding it, such as the hips, both front and sides, and also from the very top of the glutes down to the start of the thigh. The next day or two after using one for the first time, you may feel a bit sore. This is normal, allow a few days to go by to recover before you use it again. As with any exercise, do so carefully, don’t over due it, and learn the proper techniques to avoid injury and to get the best results.